You make the run or you're out. Hi, i'm Sturmvogel Prime from the Shmups forum and you're watching a Disney game review! Guh. Never doing that again. Back in the late 80's and and the first half of the 90's Disney teamed up with Capcom, developing many memorable games. From Mickey Mousecapade, DuckTales, Chip 'N Dale Rescue Rangers, to Darkwing Duck, Aladdin and Bonkers. With these (or "DIS") hits, nobody would think the Disney-Capcom team would flop, right?. Unfortunately, there's a flop and we have to set our eyes on Baloo the pilot and its friends. 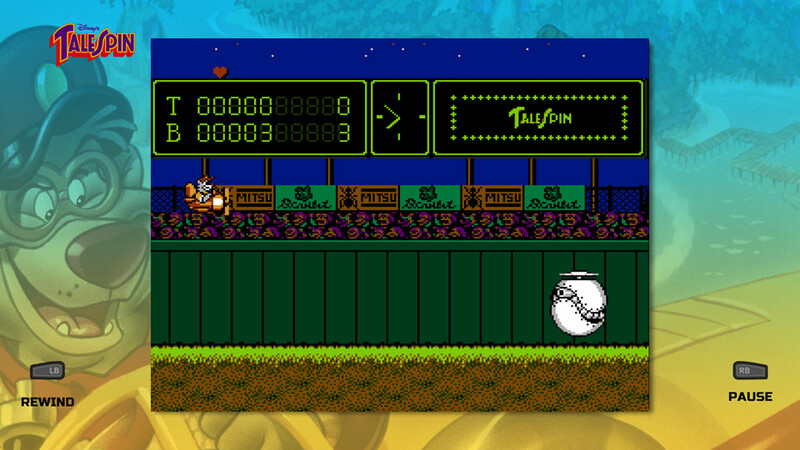 Disney's TaleSpin is a shoot'em up released on the NES and re-released on the XBOX One, PlayStation 4 and PC as part of The Disney Afternoon Collection. In this game, you'll take the role of Baloo von Bruinwald XIII, a pilot from "Higher for Hire" on a mission of completing 8 cargo deliveries while avoiding Don Karnage and his Air Pirates sent by Shere Khan to sabotage Baloo's business. The game is an horizontal scrolled shooter. One of the differences is that the score points are obtained by picking fruits instead of shooting down enemies. Fruits can be found in random spots in the stage, carried by "?" marked boxes and popping balloons in the hidden bonus levels. The game also relies on money investment like Forgotten Worlds, U.N. Squadron and Carrier Air Wing. 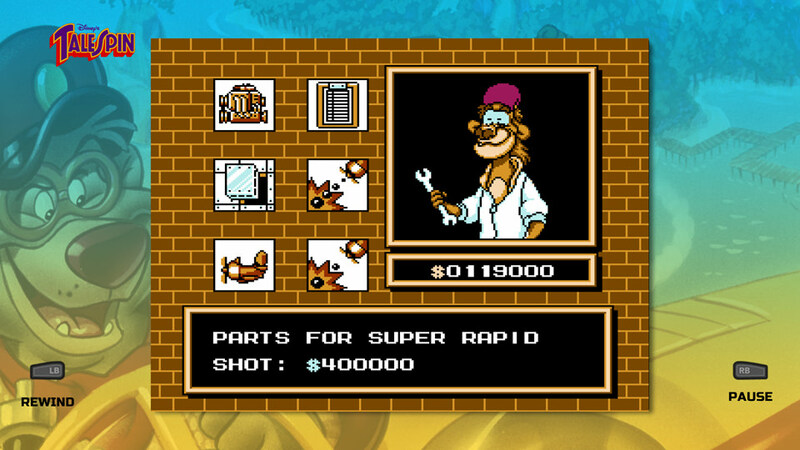 In Disney's TaleSpin, money is not obtained by the enemies, but by picking "Cargo" boxes and bags with an "$" symbol. If you survive the level with full health you'll get the Perfect Bonus which adds even more money, although this one could be very difficult and i'll explain you why. The reason why is the controls. Unlike any other horizontal shooter where pushing up or down means move the ship vertically while firing in a straight line, in Disney's TaleSpin it means aim diagonal and go forward in an inclinated angle, resulting in a very disorientating and confusing control scheme. The inclinated climbing only happens when the game scrolls horizontally. Another problem is the difficulty. Even with simple bullet patterns, you could get killed easily since the hitbox is the whole ship. Combine that with a slow ship and fire rate of 1 on-screen bullet, we're talking about total lack of balance in difficulty, making the first three levels quite frustrating. Thinking on a shmup with broken controls and unbalanced difficulty issues such as these is like thinking on a major failure in a Disneyland ride when the park is full of visitors. Air Surfing, it's like Silver Surfer, but years before Disney picked up Marvel. Despite the flaws there's some interesting features. The first one is you can aim backwards by pressing the A button, this will make Baloo's Seaduck to flip and fly upside down. But also it is a vital key on stages with maze-like passages (Stage 2 for example), since flipping the ship makes the screen to scroll back to the left. This is very helpful to pick cargo and find secrets like hidden 1Ups, Full-recovery Hearts and Bonus levels. The Bonus levels are much easier. 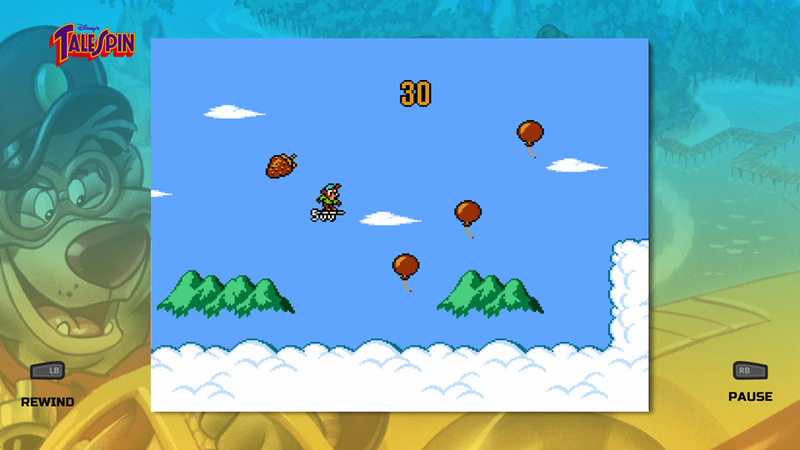 In this part of the game you'll take control of Kit Cloudkicker and you have to glide his hoverboard and pop baloons that give you fruits and one of them have a 1Up. Hey Shin!, i've got some Sidewind...er, wrong game. At the end of each level, you'll enter on a shop where the lion Wildcat will offer you 6 upgrades. ENGINE PART ($200,000): Increases the Seaduck's speed. BODY PART ($300,000): Adds 1 Heart to your Zelda-like heart gauge. RAPID SHOT ($40,000): Increase your fire rate to 2 bullets. SUPER RAPID SHOT ($400,000): Adds a 2 more bullets for an total fire rate of 4 on-screen bullets. CONTINUE MEMO ($20,000): Gives you an Extra Continue. This upgrade can be picked as much as you want, but the price increases each time (example, from $20,000, the next costs $40,000). MINI-SEADUCK ($100,000): The 1Up of the game, adds one extra ship. Like the Continue Memo, the Mini-Seaduck can be bought as much as you need. In my opinion a rather "Desperate" item since you can get them for free in the stages and bonus levels. Yes, the shop format is basically the same as McCoy's Storehouse from U.N. Squadron/Area 88, but unlike that game, you can only buy one upgrade per level due to the high prices of most of them, so you can't go wasting money if you want to save it for the most expensive items, and this is where the most frustrating problem hits: If you continue the game, your money is resetted down to zero. So, your gameplay has to be near-perfect. In the Disney Afternoon Collection port, there's a Forza Horizon-like Rewind function that works as a Save State on an emulator, helping a little with your gaming session as you try to adapt to the game's controllers. But there's a problem, using it could cause the game to crash or experience slowdown, so, using the Rewind function is not an option. There's a Boss Rush mode where you play with the fully upgraded ship and the objective is to defeat all 8 bosses in the fastest time possible. To increase the replay value in the compilation, there's a Time Attack where do you have to finish the game in the fastest time possible, the only problem is that the timer rather than start running when the stage begins, it starts as soon as the game boots up, so you'll already lose 4 seconds in the copyrights screen before the title screen appears, not to mention the time spent on the store. It's the same issue than the Caravan Mode on the ACA Neogeo games. In graphics, it's really appreciated the show accuracy of the character portraits and how the cartoon atmosphere was adapted to the game. Seems like Disney contributed on the "drawing-to-pixel" adaptation rather than just giving the license and let the developer do the rest "a la LJN", which results in this colorfully made 8-bit cartoon. As for its Disney Afternoon Collection port, the menu of the compilation is very 90's, to be more exact on the color, fonts and patterns used on the "block" used by Disney Channel back then, so it's "A trip down Memory Lane" in terms of show accuracy. In sounds, well, like they did in DuckTales and Chip 'N Dale Rescue Rangers, Capcom did a good rendition of the TaleSpin opening theme. As for the rest of the soundtrack, it fits on the cartoon atmosphere of the show using catchy tunes. - This is the lone shmup in Disney's library of NES games. - The game text font used is the same of the Megaman games. - The game and the cartoon time-line are based on the Post-World War I world since Baloo said "The Great War ended 20 years ago". - Other traces of this post WWI/1930's world are the technology of their timelime. In TaleSpin's world, the helicopter and jet engines are experimental. - The names of Baloo and Shere Khan in both Jungle Book and TaleSpin comes from the word "Bhalu" which means "bear". "Shere" is another hindi word which means "Lion/Tiger", while Khan is a South Asia title and/or surname. - The achievement name "Plunder & Lightning" is a pun on "Thunder & Lightning". - "Plunder & Lightning" is the name of the 4-part story that comprises episodes 8 to 11 of the TaleSpin series. - "Time Waits For No Bear" is a wordplay on the Rolling Stones song "Time Waits for No One". - "Time Waits for No Bear" is the title of the 7th episode of the cartoon series. - "Gruel and Unusual Punishment" makes reference to the phrase "Cruel & Unusual Punishment". - "Gruel and Unusual Punishment" is also the title of the 42nd episode of the show. It's hard to believe that Capcom and Disney blew it when they made a successful pattern of one good game after another. As for Capcom, this is a shmup flop due to its unorthodox controls and weapon mechanics, something hard to believe after they brought us Forgotten Worlds and U.N. Squadron. Disney's TaleSpin is one of those games that both Disney and Shmup fans must avoid. Because under it's family friendly appearance there's unfriendly controls and unfun gameplay lurking around the corner.